His experience in Latin America, being the first Latin American leader of the Catholic Church, his decision to echo some of the precepts of the movement founded in Latin America within the church founded in Latin America known as Liberation Theology and his decision to beatify a murdered Salvadoran archbishop are all elements in the Pope’s focus on Latin America. The “Dirty War” that Francis lived through lasted from 1976 to 1983. Thousands of left-wing leaders, social activists and union chiefs were murdered by a military dictatorship bent on eliminating what it called Communist subversion. Three years ago, Argentine courts ruled the Catholic Church was complicit in the human rights abuses and that its silence protected the dictatorship. The courts said that some priests in Argentina actually participated in the state’s repression. When Francis became Archbishop of Buenos Aires in 1998, he said he regretted not doing more for the victims. Last year, Pope Francis electrified Latin America with a stunning announcement. After years of opposition from within the Catholic Church itself, right-wing politicians and business leaders in Latin America, the Pope nominated a murdered Salvadoran archbishop for sainthood. The archbishop was Oscar Romero. Romero forcefully challenged state repression in El Salvador. He was killed by a government-linked death squad while he celebrated Mass in the capital of San Salvador in 1980. The killing triggered an insurrection, led to the creation of a guerrilla movement in El Salvador and led ultimately to a brutal civil war. The United States backed the Salvadoran military against the guerrillas, known as the FMLN. Romero is an icon in Latin America. By focusing on Romero, Francis signaled his empathy for the ongoing struggle for economic and political equality in Latin America. Which brings Francis to Juárez, a place that’s suffered the kind of violence that once plagued Argentina. “Being him, a cleric from Latin America who became Pope, has given him a deep understanding of the dynamics of this phenomenon,” said Mexican documentary photographer Julián Cardona in downtown Juárez. Cardona said he loves the fact that the Pope is using his platform to promote social change and equality, something Pope Francis does not decouple from faith and religion. “And people who are non-believers are hearing his messages and are paying attention to him. People like me. And I think that makes a difference compared to other popes,” Cardona said. By now, Juárez’ story is well-known. A cartel war, war between the cartels and the Mexican government, a Mexican Army deployment and rivers of blood that crested here — at least statistically — in 2010. 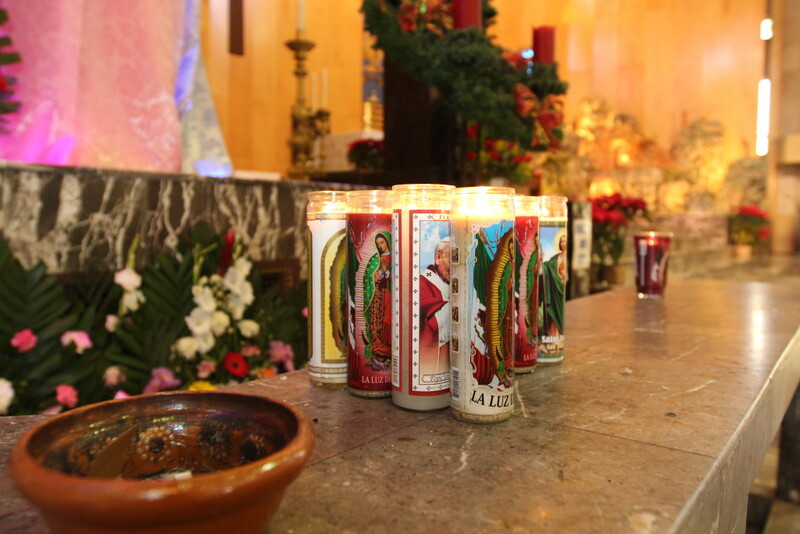 Father Trevizo said victims of violence will be hosted in a special section at the Mass. “We need to hear this message because in Mexico, it’s no good situation for the people, it’s poor, is violence, in our country right now! It is not a problem that is just economic or political. It’s in our soul. It’s in our life. We need to change deeper.” said Trevizo. Outside Cathedral of Our Lady of Guadalupe, on a bustling square five minutes from the border, Maria Elena Glazer is signing a message book in front of a life-size image of Pope Francis. “I’m proud the Pope’s a Latino,’ she said in Spanish. She’s confident the Pope will address Juárez’ challenges. “There’s a crime problem here,’” Glazer said matter-of-factly. Of course, the Pope is not just a religious leader. He was welcomed as a head-of-state when he addressed the U.S. Congress in September where he talked about immigration. Before that, he helped thaw the ice between the U.S. and Cuba. He’ll lead Mass on Mexico’s southern border with Guatemala, and here, across from El Paso, Texas, on Mexico’s northern border, fitting for a pope so deeply connected to Latin America and one of its principal challenges, namely immigration and root causes of flight. This entry was posted in fronteras desk, fronteras npr stations, Radio and tagged argentina dirty war, arnetina, cartel, el salvador, Juarez, oscar romero, pope francis. Bookmark the permalink.